The knee is one of the most commonly injured joints and appears in a wide range of clinical environments. Over the past 4 weeks the knee course has been running on PP+ and the participants of the course have been learning anatomy, assessment and treatment and rehab across different ages and pathologies. Watch this video for Dr Barton’s Top 10 tips for treating knee pain and without giving too much away watch out for load, load and more load. This video will change your delivery and prescription of exercises completely as well as your expectations of alternative treatments to exercise. 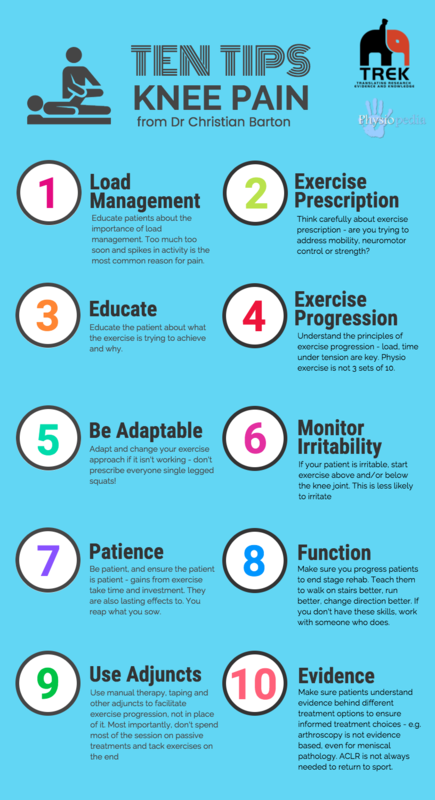 Specificity, how to monitor exercise progression and safe progression of exercise are all covered along with the holy grail of exercise prescription…getting the patient to remember their exercises. Take a look and let us know what you think via social media. Read more from Dr Barton at Complete sports care, twitter or his patellofemoral pain blog. To compliment this interview Dr Barton has kindly provided this infographic to aid your learning. What are your top 10 tips? Let us know via the usual channels.